Kaizen is practical method for improving any processes, and thus it can also be applied to the design and delivery of courses. In order for kaizen to be effective, kaizen participants must be given strict conditions under which improvements are made. These conditions take the form of “Nos” or “must-nots” – things that people must not do or must not consider as they work to improve a process through trial-and-error. The purpose of specifying Nos or must-nots is to force people to think of ways to improve without relying on the usual resources such as: more people, more money, more space, more material, more equipment, more software, etc. When people rely on these, the result is the appearance of improvement, not actual improvement. 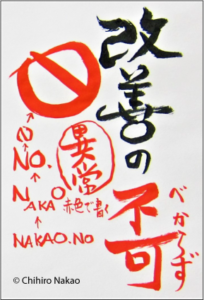 The Nos that I have identified for my own teaching, both course design and delivery, are inspired by sensei Chihiro Nakao, whose Nos for kaizen in manufacturing are legendary among those who have been fortunate enough to experience kaizen with him as the facilitator (“No AKA“). 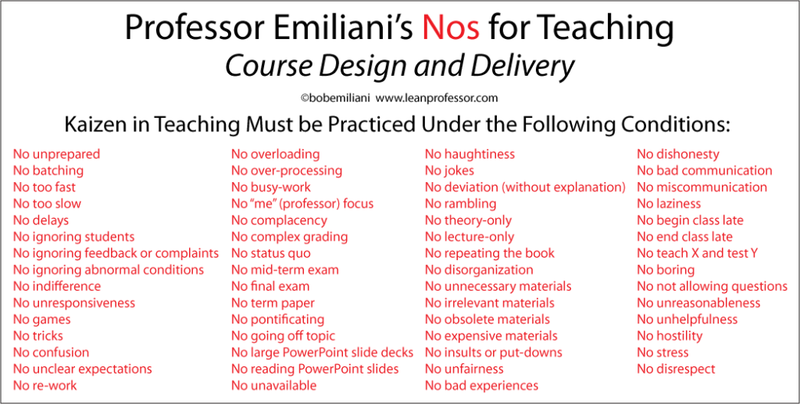 My Nos for teaching have been developed over many years of applying kaizen to the design and delivery of my own courses. There are 59 Nos (presently). The result have been outstanding for me as a teacher and, most importantly, for students and for learning outcomes. The same could be true for you as well, regardless of the subject matter that you teach.